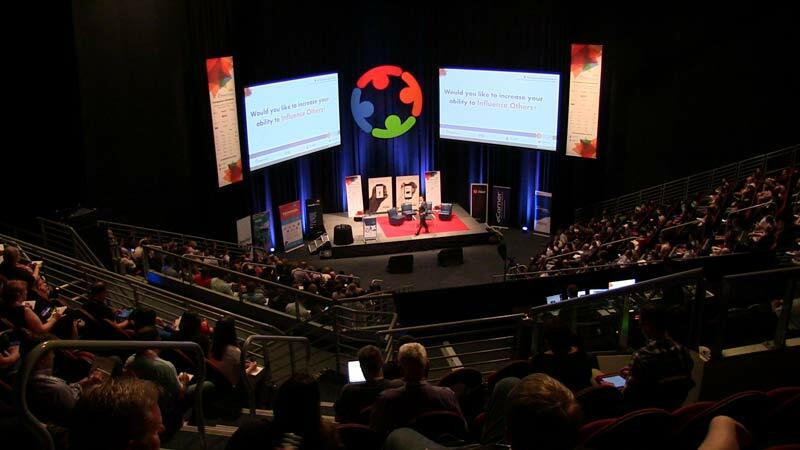 A couple of months ago, I attended the Gold Coast Internet Conference. I was very fortunate to be invited with my good friend and colleague Anthony McLean from Social Influence Consulting Group. Before I go further into what I am going to talk about, let me tell you about Anthony. Anyway, Anthony was on my back to COME AND DO THE PRINCIPLES OF PERSUASION COURSE. I admit, when he was asking me, I was very nonchalant about it, sure, it might be good, but I didn't really see it as something I really needed to do, or wanted to do. As the time drew near to attend the course, I was like…man, I'm so busy, can I afford to spend 2 days in a room with Anthony and other course participants doing the course. I have attended many courses in the past and found the information, whilst at the time seemed cool and great, I never really followed through or stuck with what I had learnt. In a nutshell, the information I obtained never really pushed my buttons after the event. However, after attending Anthony's 2 days of him delivering Cialdini's material, I was an instant convert. This stuff was some of the most mind blowing, amazing information I had ever received. You see, I was sort of doing stuff, that I thought was good, cos, I thought it was the right thing to do, but, after being introduced to the “Principles Of Persuasion”, I saw a framework, a reason so to speak as to why I was haphazardly doing the things I was doing. What things were you doing you ask? Interacting with my clients, speaking to potential clients, following up with clients, talking to people, my kids, my life. Man, it was like 1000 light bulbs were going off. Now, I'm not a total newbie to behavioural psychology. In a previous life as a police dog handler, I was an avid student of operant conditioning and the basics of behavioural psychology and how it applied to my current profession as a police dog handler and I thought I had a pretty good handle on that stuff. But learning the Principles of Persuasion took me to another level. During the course, I learnt to understand the 6 Principles of Persuasion as taught by Anthony and Dr Cialdini. Each principle was explained in detail along with things called activators and amplifiers which in a nutshell accentuate the 6 principles of persuasion. I won't go into detail about those, because this post could be massive. Needless to say, I said to myself after the course, I need to saturate my brain with this stuff, so I went about putting cues in my immediate workplace and life to constantly remind me of what I am doing regardless of what I was doing, interacting with people on the phone, via instant messaging, online or general conversation. 2 months on and I can instantly recite the 6 principles, understand what they are and know exactly what I am doing during any interaction, with a client, potential client, friend or my family. Now before you go, hey dude, you are being a manipulative prick. No, I am just doing the right thing. I always respected and appreciated my clients, admired and cherished my friends and love and adored my family, but now, I truly understand how I can be a better business man, friend, dad and significant other applying the Principles of Persuasion. How? Because these principles don’t work unless both parties benefit. Now, back to the Internet Conference. Anthony was a keynote speaker on the second day in the main Auditorium. Roslan Kogan, from KOGAN opened on the day and Anthony had to close on the day, after a full on day of people absorbing and getting pitched to from everyone and sundry so energy and attention levels were low. I have seen many speakers in an auditorium speak before, but I tell you, man, this bloke has a skill, he can hold you captivated the whole time. Entertaining, funny and informative. I mean, even Dr Robert Cialdini, the guru of influence says.. In front of a crowd, Anthony McLean is positively Magnetic, drawing from his audiences levels of attention, comprehension and insight that are remarkable. What a competitive advantage it is to have him as a teammate! Now, that's not a bad recommendation. Anyway, I am coming to a point here. During the 3 days, we had quite a small booth compared to the others around. I mean, there was some serious coin spent on displays by other companies. I was there with Anthony and Dan Nikas, the Social Media Mechanic. 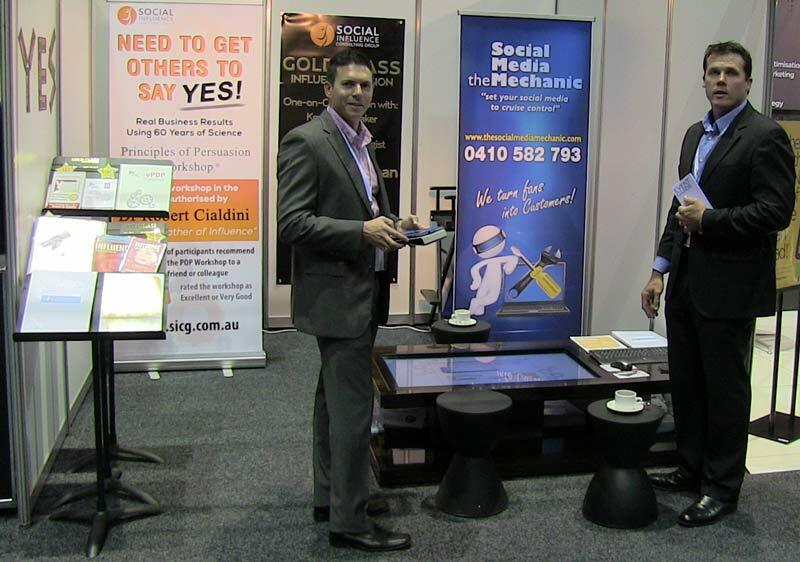 We had a few banners and we had this cool interactive table so we could do displays to people, pull up websites and show stats etc, was a real cool tool. Now the point. We were in a massive hall full of exhibitors, that were all trying to get people walking by, come over and talk to them about their business or product. And this was the thing, every single exhibitor there was trying to influence people to come to their booth and speak to their representatives. Not only that, pretty well, every single person walking in this venue had an online business and their primary goal as an online business was to get people to come and buy at their ebay store or website. So they were looking around for something that was going to give them a tool, product or service that might help them give an edge, the new thing or best thing to influence people to buy their stuff. Not only that, during the 3 days there were constant workshops delivering information to help these people influence potential buyers with the information they were giving in these workshops. So there was a constant bombardment of information to these people of stuff and stuff and more stuff. How unfair was it that we had Australia's leading expert and the world's only Master in Influence on our stand? I was looking around at everyone thinking to myself, we are all in the influence game as were all the people walking around and by us, whether they know it or not. I looked around and there were some pretty flash setups, in comparison, our stall was small, and we had some basic stuff…but man, we were flat out. Anthony knew exactly what had to be done in our small stand and we did not have time to scratch ourselves. The conversations that were had blew peoples minds, if we could power the light bulbs going off in people's minds at our stand as Anthony, Dan and myself spoke with people, we could have powered a small town. After attending that event I realised, not only are all business trying to influence, but as we all are in our own lives. Get the kids to clean their room, getting a significant other to do something for us..influence is everywhere. But, the approach to do so is often attempted without any sort of plan. The 6 Principles of Persuasion, as I see it, is probably the most powerful information anyone can understand and implement in business and our day to day lives. There is one closing thought I want to leave all who are reading this with. Often, people see these principles as bordering on or being manipulative. Yes, you can use this for evil, but there is one underlying principle that sets these apart from all other forms of getting people to do what you want them to do. If you approach everyone and everything you do in applying these principles in an ethical manner, these 6 principles of persuasion, bar none are simply the most powerful tools any person in business, or even in a social situation can use. Now, I write this without fear of sounding evangelical, but I can simply say, in the information I have acquired in my lifetime, and I am an information junkie, the 6 principles are bar none, the best information I have every acquired. I have experienced first hand, in the last 3 days how powerful this information is. I invite you to explore it for yourself. Glen Wilson is an internet marketer assisting business gain a greater exposure online utiliseing the latest methods in online marketing I am the principal and owner of Ozweb Internet Marketing a business that provides online services for businesses. I specialise in growing their online presence, improving their reputation, increase sales and make more money. Your words are kind and mean a lot because I have seen the change in you and your business since attending the workshop. The proof is in the pudding my friend. People who are motivated to make a difference in the way they influence people will get an enormous amount out of the workshop. Those who think persuasion is a soft skill that anyone can do are not my clients. For the followers of your blog all I can say is “Listen to Glen and what he has to do say. ‘I do’ and that is the highest recommendation I can give someone”. Forbes Talks About Managing Your Online Reputation.